That made me interested to learn about Spinoza and his philosophy. In wikipedia i found something interesting. I'm not a student of philosophy, so i didn't know much about his ideas. But i enjoyed his view points while reading it for the first time. Spinoza contended that God and Nature were two names for the same reality, namely the single substance (meaning "to stand beneath" rather than "matter") that underlies the universe and of which all lesser "entities" are actually modes or modifications. Spinoza contended that "Deus sive Natura" ("God or Nature") was a being of infinitely many attributes, of which extension and thought were two. 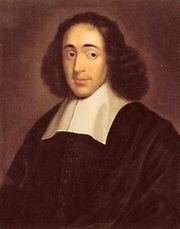 i believe Spinoza reflected the same tought that is stated in the Vedanta (Hindu) Philosophy about the impersonal mode of God, which also is reflected in the Quran and Taoism. The impersonal form of God is truly something we all need to grasp cause in the western religions such as Christianity and Judaism, God is made too much into a personal deity, while forgeting the impersonal side of Him. :: Whatsoever is, is in God, and without God nothing can be, or be conceived. :: God and all attributes of God are eternal. :: So long as a man imagines that he cannot do this or that, so long is he determined not to do it: and consequently, so long it is impossible to him that he should do it. :: Emotion, which is suffering, ceases to be suffering as soon as we form a clear and precise picture of it. :: Individual things are nothing but modifications of the attributes of God, or modes by which the attributes of God are expressed in a fixed and definite manner.